New Stickers Design for 2019! Mid Middle - ideal for all round stroke play on both the front and back foot. Minimal Concaving - creates a wide sweet spot. Flat Face & Very Thick (38mm+) Edges - the biggest bat in the Viking range! 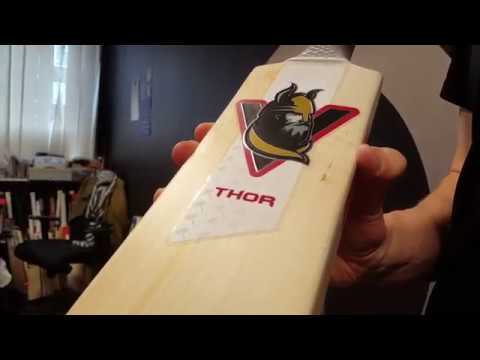 A great value cricket bat from one of the most exciting new brands in cricket, Viking Cricket, the Thor SE Cricket Bat is handmade in Yorkshire, England, by Master craftsman, James Dollive, using traditional methods. A veteran bat maker, with over 20 years of experience, Dollive inspects every Thor SE Cricket Bat at every stage of the process to ensure the highest quality available, with all bats pressed to achieve the optimum balance between performance and longevity. All Viking Thor SE Cricket Bats are made from unbleached, seasoned grade 1+ English Willow (Pro Grade). The mid middle and duck bill toe combine to create a light and balanced pick-up, making the Viking Thor SE Cricket Bat ideal for all round batsmen who are strong on both the front and back foot, but the Thor is also the biggest bat in the Viking range, with very thick (38mm+) edges, so it is the perfect choice for the big hitter! So go on, take a Viking out to bat this summer!